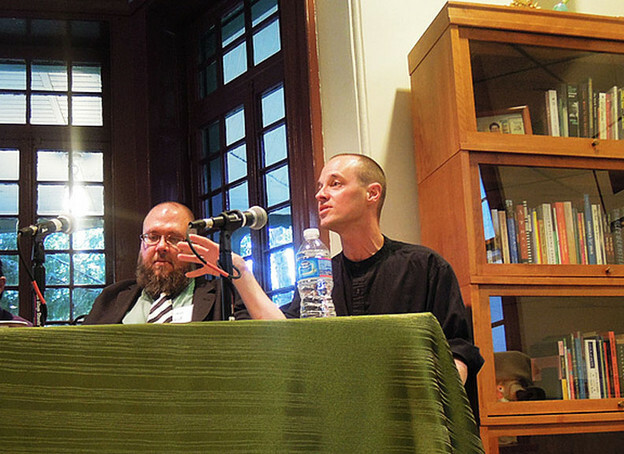 Brian Reed and Craig Dworkin at Kelly Writers House, April 2013. The chronology of Conceptual Writing has always been slightly out of sync. The term was coined in 2003, in the title for The UbuWeb Anthology of Conceptual Writing, a gallery of online works that brought together texts from the traditions of Conceptual Art, the OuLiPo, and avant-garde poetry. A printed volume, Against Expression: An Anthology of Conceptual Writing (Northwestern University Press), developed from that online collection, but would not be published for another eight years, by which time the idea behind the name had morphed. Although it used the same titular phrase (“anthology of conceptual writing”), the book presented a far more focused genre of writing than the website, and it made a diametrically opposite argument. Indeed, as became evident at the conference Conceptual Poetry and Its Others, organized by Marjorie Perloff for the University of Arizona Poetry Center in the summer of 2008, the label “conceptual writing” resonated in a peculiar way: everyone immediately seemed to know exactly what it designated, but it meant something distinctly different to everyone who took it up (the “Others” of the conference title and the plural of “Conceptualisms” — if not the allos behind the “allegory” central to Place and Fitterman’s book — all register this scope of alterity). The topic thus had its first academic conference before it was anthologized, and its first anthology, in turn, before it had developed an in-house journal. While one can retrospectively trace emergent tendencies back to occasional issues of certain periodicals — Chain (edited by Juliana Spahr and Jenna Osman), Object (ed. Fitterman and Kim Rosenfield), Nypoesi (ed. Paal Bjelke Andersen), the poetry section of The Brooklyn Rail (ed. Mónica de la Torre), and et cetera — the first soi-disant “journal of conceptual writing,” Riccardo Boglione’s Crux Desperationis, did not publish its premier issue until 2011. To be sure, the venerable Poetry magazine had included a portfolio in its summer 2009 issue, pitting Flarf in a fixed fight against Conceptual Writing, but with only a half-dozen authors (Fitterman and Place) included it merely hinted at rather than offer any kind of clear or comprehensive definition. By the same token, Kenneth Goldsmith had publicly tested the phrase in a report for the Poetry Foundation in 2007, but there it appears as just one term among others, with “uncreative writing,” “information management,” and the “unboring boring.” With a second major anthology, I’ll Drown My Book: Conceptual Writing by Women (edited by Caroline Bergvall, Laynie Browne, Teresa Carmody, and Vanessa Place) forthcoming, the surprising chronology is worth reiterating. Against the expectations established by most literary movements, the initial presentation of the work under the sign of “conceptual writing” — the appearance of poetry as conceptual writing — followed not only its first academic conference but also its first critical monograph, Marjorie Perloff’s Unoriginal Genius: Poetry by Other Means in the New Century, published in 2010. Notes on Conceptualisms thus entered the debate, in 2009, with an epic timing belied by its diminutive format: in medias res, and with a strangely belated prolepsis. The title (“notes on” rather than “notes toward”) implies subsequence, but in many ways it came before the establishment of the subject it would seem logically to follow. This history adds another wrinkle to the curious chronology of “conceptual writing,” but more importantly it means that Notes simultaneously shaped the field it purported to describe, substantively remolding the subject on which it seemed to coldly comment. Notes traces the swirl of a further circle of recursive influence and inflorescent reference. If the response to previous avant-gardes is any indication, the wider reception of Conceptual Writing will swing between a focused roll call of clubby signatories and a meaningless inclusiveness. First will come the anxiously pointed demand for a clear definition: what is Conceptual Writing? Second, threatened conservatives will dismiss it as nothing new, or they will disingenuously ask whether all writing isn't conceptual. Then, the reverse swerve will try to sidestep definitions altogether by merely naming names: conceptual writers are those in a certain anthology, or on a certain listserv (or in the Appendix to Notes …). Finally, the reaction will veer back broadly again as otherwise incompatible poetics absorb various surface techniques (cataloguing, reframing, appropriating, etc. ): one will start to hear explanations like “I’m kind of a conceptual writer” or “This is my conceptual poem.” The remarkable sweep of Notes on Conceptualisms manages to provoke and preempt all of these phases at once, and this purview was possible, perhaps, only because of the chance moment at which Notes was published — a brief wink in which “Conceptual Writing” had apparently always long been practiced, and yet had still not quite commenced. That world will not always be the case. Following the publication of the Danish edition of Notes on Conceptualisms, the publication of I’ll Drown My Book provided an opportunity to consider questions of gender, community, and Conceptualism in more detail. The following briefly outlines the argument of the conclusion of my talk at the Poetry Communities conference. A comparison between the two soi-disant anthologies of “Conceptual Writing” is instructive for understanding the vagaries of the term. Against Expression includes about thirty women, fourteen of whom are also included in I’ll Drown My Book (the other sixteen, presumably, could all have been included as well). 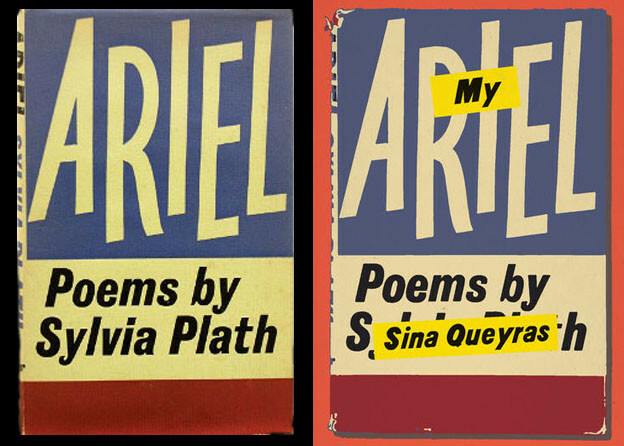 The converse, however, does not hold true; very few of the works included in I’ll Drown My Book would have qualified for the editorial criteria used by Against Expression — most would have been considered to be “too creative.” Rather than scold us for sexist exclusions, I’ll Drown My Book confirmed the integrity of our inclusions. Of all the contributions to I’ll Drown My Book, there are only two I regret omitting — Hannah Weiner’s Code Poems (which we had in fact considered) and Rosemarie Waldrop’s mashups of Wittgenstein sentences, which we overlooked. Only a scant handful of others could even have been possibilities. Had we pursued the poetics of heteronyms, like those used by Fernando Pessoa, we would certainly have included Erin Mouré. We might well have chosen Sarah Dowling instead of Jen Bervin as an example of the technique of “writing through” a source-text. Similarly, we might have chosen Wendy Walker instead of John Cage as an example of mesostics. The discrepancies between the anthologies are a projection of the different ways the two books organize their textual communities around a certain name. Against Expression started with a descriptive poetics and a very narrow definition, isolating a certain kind of text to which the name “Conceptual” was assigned. In contrast, I’ll Drown My Book seems to have started with the name, to which it deliberately adduced a proliferation of quite different kinds of texts. So where the burden for Against Expression is to explain what else might have been included, the burden for I’ll Drown My Book is to explain what conceivably might not have been included. In both cases, the literary communities established by these anthologies rely on exclusion (gender in one case, kinds of subjective creativity in the other). Those exclusions are worth remembering, because what ultimately defines anthologies — like all communities — is not what they embrace and contain, but what they exclude or omit. Communities depend upon the logic of the scapegoat.